Born in 1965 in Tehran, Iran. Graduated in painting from University of Tehran in 1993. Founded Icarus Art Center in 2002 and started teaching on drawing and painting in this art center. Lecturer in University of Tehran since 2002. Lecturer in Al-Zahra Art University since 2003. Participated in the International Contemporary Drawing Exhibition in Tehran Museum of Contemporary Art in 1999. Participated in the Contemporary Iranian drawing exhibition in Tehran Museum of Contemporary Art in 2000. Participated in the 6th and 7th exhibition of contemporary Iranian drawing in Barg Gallery (2002 and 2003). 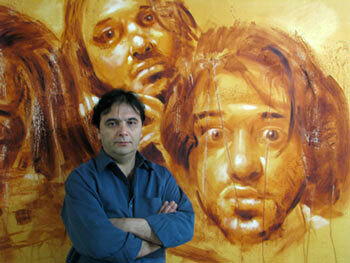 Participated in the exhibitions of Contemporary Iranian Drawing in Atashzad Gallery in 2003, 2004, and 2005. Participated in the masters of Al-Zahra University group exhibition in Kamaleddin Behzad Gallery in 2003, twice. Awarded with Certificate of Merit in the 6th exhibition of contemporary Iranian drawing in Barg Gallery in 2002. Presented art works created between 1994 till 2003 in the first, second and third exhibits of Barg Gallery in 2003, a review of 10 years’ drawing (including 3 periods of Dark, Emptiness and Bright) with over one hundred figurative drawings. Participated in the Persian Contemporary Realist and Hyper Realist Painting Exhibition in Niavaran Artistic Creations Foundation in 2006. Participated in the exhibition of Devotion Art, painting exhibition: A Window To Heaven in Saba Institute of Culture and Art in 2007. Participated in the 7th National Biennial of Iranian Contemporary Painting in Saba Institute of Culture and Art in 2008. Participated in a selection of paintings by instructors of art colleges in Tehran, Tehran Museum of Contemporary Art in 2008.